The rise of donut and biscuit consumption is giving way to culinary creativity combined with adventures in flavor at Rise Biscuits and Donuts. Rise’s latest location opened this year at Regency Centers’ Cameron Village, located at 2068 Clark Avenue, Raleigh, NC. With more stores planned for 2018 along with other specialty donut and coffee shops booming around the world, it seems as though donuts may be replacing the cupcake. What’s the big dough about the Rise franchise? Rise Biscuits and Donuts first opened in Durham back in 2012, and has since grown into a regional chain with 14 locations across the south and expansion slated for early 2018 in Greenville, SC and Austin, TX on Guadalupe Street. Finding much success near campuses in the south, Rise Biscuits and Donuts is carving out its place in the specialty donuts industry by offering more than just traditional donuts and biscuits. The donut shop is marked aesthetically by its bright colors and massive open kitchen, while its menu offers a scintillating variety of breakfast and lunch biscuits and donuts that feel more like a meal. Take for instance, Rise’s fried buffalo chicken biscuit with blue cheese sauce and shaved celery or their PPB—pistachio, pineapple, and basil donut. Rise’s menu items reflect in part the growing trend across America for weird donut flavors and extraordinary preparation of ordinary foods. David Sprinkle, research director at Packaged Facts, remarks on trends in flavor saying that one doesn't have to look very far to find the 'next sriracha' or 'matcha tea' flavored anything. Even the most ordinary of menu items, a traditional chocolate donut, can be dressed up as rich as a DIY ice cream sundae. Speaking of ice cream, Empire Bakery reported this summer of another weird donut trend involving ice cream and fried dough. Donuts are also trending as a wedding food offering. Professional wedding services provider Brodie Homestead reports that the donut trend is a culmination of familiar comfort food with something that is novel and unexpected. Couples are moving away from formal fine dining and are attracted to doing anything interactive and fun—like doughnuts on a stick or wall. 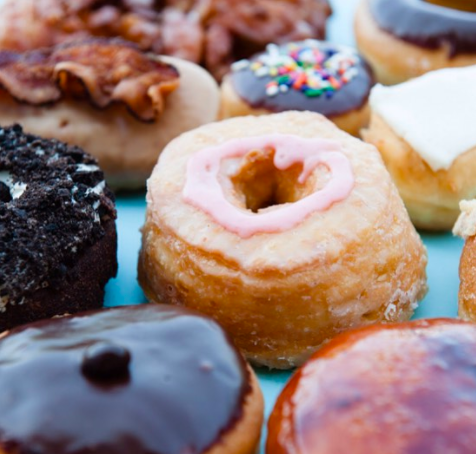 While non-traditional donuts like Sushi donuts have mirrored trends in foods and flavor across the food industry, it is no surprise then to see items like a maple bacon bar and crème brulée doughnut included among Rise’s offerings. As 2018 approaches, experts agree that culinary adventures will continue to appeal to a growing number of consumers. Packaged Foods reports that culinary trends in 2018 will be inspired by familiar comforts from our childhoods but with artisanal, indulgent, and downright delicious reimaginings that satisfy the appetites of traditionalists and foodies alike. In addition to exciting flavors, colors will appeal to consumers in similar fashion as the Starbucks’ Unicorn Frappuccino. National Restaurant News reports that the more photo-friendly your food, the better. Offering both visual appeal and appetite adventures, companies like Rise Biscuits and Donuts will likely continue their march in line with similar inspirations and indulgences.